М.: 2016 - 54 с.
Английский язык. Языковой портфель. 8 класс. Пособие для учащихся общеобразовательных учреждений. This Language Portfolio is your property. It has been designed to help you improve your language learning. It will accompany you throughout your school life and will help you document your learning both inside and outside the classroom. given by your teacher, throughout the course. 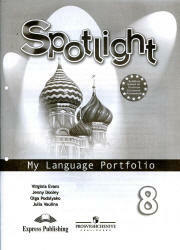 However, the final decision of what to include in the Language Portfolio is completely up to you. In practice, Language Portfolios may include a project or other examples of written work, computer diskettes (with some work or drawings completed inside or outside the class), video cassettes (with your favourite story or with performances of songs, school plays, etc), certificates, reports from your teachers, or even a collection of objects or pictures.